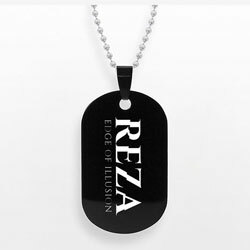 Anodized aluminum 1.5mm tag featuring Reza's logo laser engraved on one side with a 24" aluminum chain. Text with one hand, snap better photos, and stop phone drops! 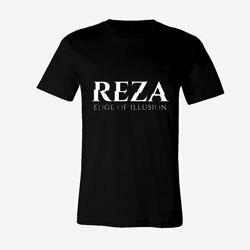 Extreme comfort t-shirt featuring Reza's logo on a uniquely soft tri-blend, modern fit, tee. Fabrication: 50% poly 25% cotton 25% rayon, 3.8 oz. 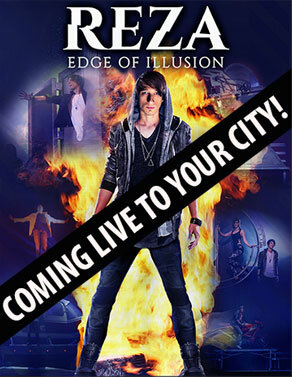 Includes Reza's coloring book illusion (drawings magically color themselves! 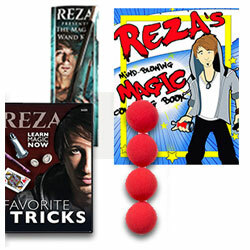 ), Reza's favorite tricks DVD (learn 14 amazing ilusions!) Sponge Ball Illusion (sponges magically jump from your hand to theirs), Magic Wand Kit (includes 9 amazing illusions), all for $30! 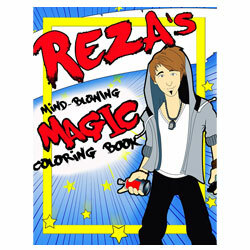 This original Magic Coloring Book features outline drawing's of Reza and his assistant's performing his signature illusions. At your command, the drawings magically become brilliantly colored, turn blank, and then back to regular outlines for a sensational illusion anyone can do. Great gift for ages 5 and up! Very easy to do and looks amazing. Learn Instantly. Book measures 11 x 8.5 inches. 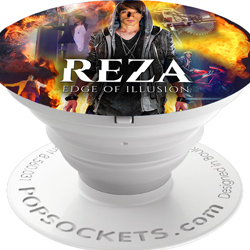 Reza teaches you 14 highly visual & easy to learn magic tricks that anyone can do!